Lipper Schoolhouse Desk and Chair Set - Vanilla by Lipper International at Indsight. MPN: 564AW Antique White. Hurry! Limited time offer. Offer valid only while supplies last. 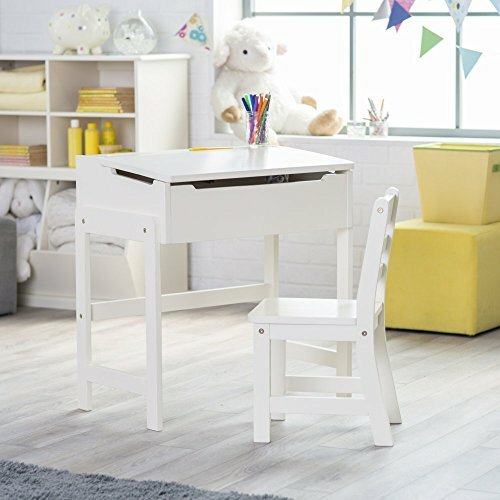 Give kids a fun and practical space to work on homework or create artistic masterpieces with the Lipper Schoolhouse Desk and Chair Set - Vanilla. Give kids a fun and practical space to work on homework or create artistic masterpieces with the Lipper Schoolhouse Desk and Chair Set - Vanilla. Sturdily built of beech, pine, and wood composites, this desk features a vanilla finish that will make it look right at home just about anywhere. A coordinating chair is included. Lift the desktop to reveal spacious storage for school and art supplies. Some assembly is required. Desk: 25.5L x 16W x 26H in.. Includes 1 matching chair. Durable beech, pine, and wood-composite construction. Versatile vanilla finish. Recommended for children ages 3 and up. Lift-top desk reveals generous storage space. Assembly is required. Desk: 25.5L x 16W x 26H in.